The drive to San Juan de Gaztelugatxe is absolutely gorgeous as it winds through the mountains and along the sea coast. Every once in a while, the trees open up to stunning views of the Bay of Bakio. 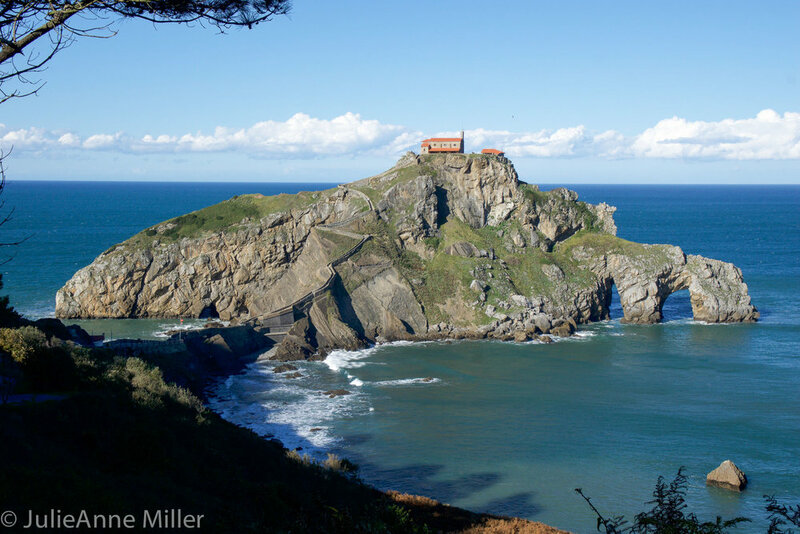 San Juan de Gaztelugatxe is a small island that has served several purposes throughout the ages - monastery, fortress, and witch-hunting ground. The 240+ staircase to the top is almost like a mini-pilgrimage, with crosses along the way to perhaps remind you to say a prayer or think of a loved one. The small church at the top was rebuilt in the 1800's and every "pilgrim" must ring the bell upon reaching the summit. While descending, climb down to the rocky base at sea level to view the photos and memorabilia left by other visitors.